With the help of horticultural LED lighting, urban agriculture is gaining mainstream acceptance. A primary cause for this momentum has to do with the spatial constraints of agriculture. To this end, traditional American agriculture utilizes vast acreages of farmland that are generally only usable a portion of the year. Conversely, urban farmers utilize areas of the urban landscape for food production deemed unusable in the past. Vertical farming is perhaps the most efficient form of crop production in history concerning the efficient use of space. Unlike other forms of urban agriculture—such as community and greenhouse gardens—vertical farming utilizes indoor gardening equipment to produce crops without the use of sunlight. As such, with the proper technologies, vertical farmers can grow crops year-round inside of abandoned buildings and shipping containers. due to the agricultural practice’s versatility, it has its own constraints. For vertical farming operations to succeed, they must create artificial environments in which plants thrive. The stasis of these artificial environments is dependent upon the technology that maintains light, humidity, temperature, and air flow. With these notions in mind, vertical farmers need to utilize cultivation technology that can successfully maintain these environments. These operations must simultaneously function in an affordable and practical way. One of the most defining characteristics of horticultural LED lighting is the unique color of the light they emit. For LED lights, this “pink” light is tied the overall operational efficiency of the technology. 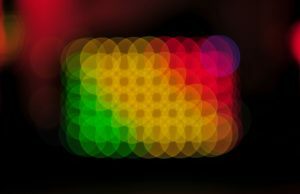 Horticultural LED lighting researchers have figured out that plants respond best to red and blue light wavelengths. The mix of these two colors results in the pink color seen in LED grow lights. The traditional light color spectrum is ROYGBIV (red, orange, yellow, green, blue, indigo, violet). In this matrix, a mix of all these colors results in the “white light” that is seen with sunlight. Traditional grow lights, seen with HPS and MH lights, seek to mimic the sunlight in certain times of the year and utilize a large portion of the ROYGBIV spectrum in this process. Conversely, LED grow lights cut out the “unnecessary” wavelengths by only utilizing blue and red spectrums. A majority of the operational, financial, and environmental perks of horticultural LED lighting are attributable to this break-through in technology. One of the most defining characteristics of controlled environment agriculture is the efficient use of space for crop production within cities. Vertical farming takes the concept of efficiency to its extreme with grow room design. A distinguishing trait of vertical farming is the layering of garden plots on high-tech shelving units. Grow lights are dispersed between each “garden layer.” Some vertical farming operations feature as many as a dozen layers of crops dispersed throughout a single shelving uni. Horticultural LED lighting technology makes the functionality of these densely populated vertical farms possible. 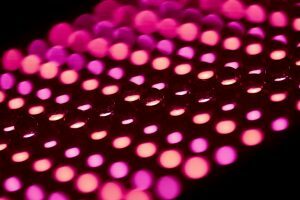 LED lighting technology can at least be partially credited with the rising popularity of urban horticulture, particularly within vertical farming. Because, LED lights are the only form of horticultural lighting technology that can grow crops on a commercial scale within the stacked layers of vertical farms. While fluorescent lights could function within vertical farms, they don’t emit strong enough light to fuel the production of most crops. 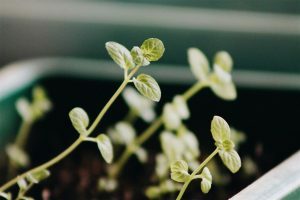 Indoor gardening and hydroponics has traditionally utilized high pressure sodium (HPS) and metal halide (MH) lighting in large-scale crop production. However, while HPS and MH lights work great for growing crops, they are notorious for emitting excessive heat. These heat issues render both HPS and MH lights practically useless within the tight confines of vertical farms. Large-scale LED powered vertical farms are referred to as “pink houses” (due to the wavelengths of light emitted by LED technology). They look like futuristic gardens taken off the pages of a science fiction novel. Horticultural LED lighting can be tightly packed in these pink houses because they don’t emit the excessive heat seen with other grow light. That being said, horticultural LED lighting makes vertical farming possible because the cultivation technology is conducive to spatial efficiency. All indoor gardening and horticulture operations are costly to operate. This notion is exponentially heightened when considering large-scale vertical farming operations that operate year-round. The primary financial drawback with vertical farming is that of excessive energy usage. Vertical farming operations are 100% dependent upon indoor gardening equipment. Therefore, each facet of these complex garden operations requires some form of electricity use. This energy consumption is financially burdensome and leaves a substantial carbon footprint. The use of LED lights for vertical farming is essential in making urban agriculture operations viable in the long term. This is evident concerning both economic and environmental impacts. To illustrate, studies show that LED lighting arrangements are 40% – 70% more energy efficient than those seen with HPS and MH lights. With these figures in mind, it seems that horticultural LED lighting is indispensable concerning the future of vertical farming. Because, it paves the way for both cost effectiveness and environmental conservation concerning indoor agriculture. On that note, forward-thinking vertical farming companies are also implementing solar power systems to lessen their strain on the power grid. The urban agriculture movement is rapidly gaining momentum. However, its overall staying power is largely dependent upon the technology that powers vertical farming operations. Government entities such as the USDA have taken notice of this trend, with the proposed Urban Agriculture Act dedicating government resources to studying LED technology. All things considered, horticultural LED lighting is intimately entwined with the progression of vertical farming on an industrial scale. Because its cutting-edge technology makes mass production possible within the confines of indoor cultivation.